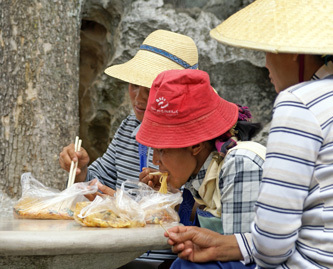 The Stone Forest is a very popular trip for Chinese tourists. 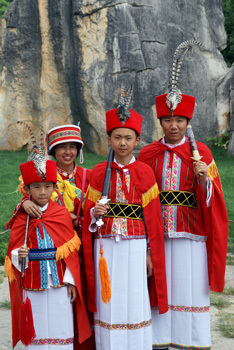 Lots of them dress up in those ancient costumes. You can rent those, just for the photo, of for the whole day. 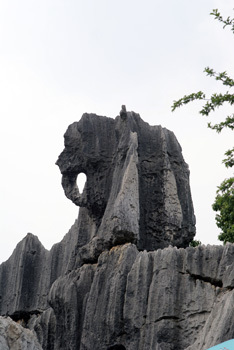 Close to Kunming is the famous Stone Forest (Shilin), a large collection of rock in all kinds of strange formations. No, it's not just penises, there are also giant turtles, elephants, Indians, and that kind of things. OK, this is China, so they don't have Indians and the rock that looks like an Indian has one of those very creative Chinese poetical names. 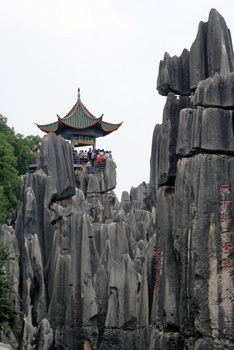 Some paths in the Stone Forest are not suited for people who are afraid of heights. Loes and Marian try one of those paths, and halfway they get stuck... don't dare to go forward or backward anymore. Some nice Chinese people rescue them, while Wim is recording everything on videotape. I hope Wim will send me a copy of that video, so I can add it to this website. 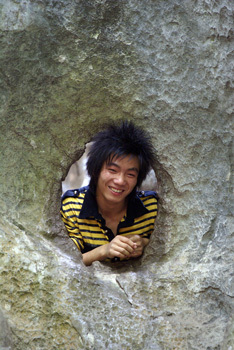 When you're in the Stone Forest on the first of May, it's even more crowded than usual. I tried to reach the viewing platform, but couldn't reach it because there were too many people. Half an hour later, I tried again; and this time they were all gone so I could make the panorama picture you can see above. 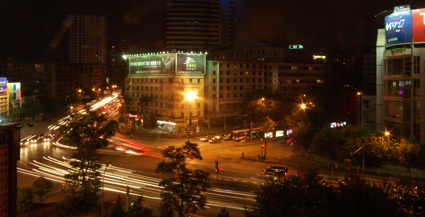 We don't see much of Kunming itself. There are 'some road works' (ahum) in the city, it's raining and the area around the hotel is boring, with shops that sell generators and compressors and stuff like that. 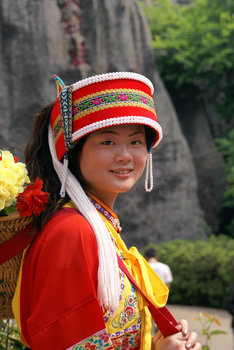 The next day, we leave early to catch a flight to Guilin.